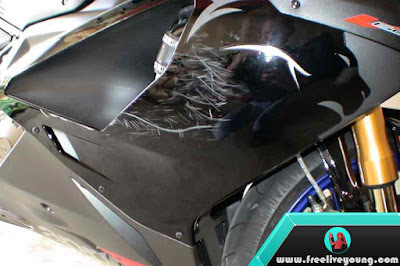 Freeliveyoung.com - How to Remove of Scratch Motorcycle Motorcycle, Have you ever feel sad when your favorite motorcycle Scratch because of parking on the roadside or parking in one of the shopping centers are less about management and control? The average Scratch that exists in Motorcycle in arises because of the friction with other motorcycles when you want to get out of the car park or hit our helmet that plugs in the Motorcycle. The mark was none other than the install paint from other Motorcycle to our motorcycle or Scratch in which the former incision took place sharp objects that either came from where. when some Motorcycle series like CBR and some other fast motorcycle in launching by Honda, no lapse long r15 and Vixion was launched by Yamaha. In addition to factors and even then the factor of women who like Motorcycle also affect the increasing number of users of motorcycle bikes. Back again discussed how to remove the Scratch, there are several ways and several stages that are believed will reduce even to remove the former Scratch on our Motorcycle. Both Scratch smooth until Scratch are in due to falling from Motorcycle. Wash the scratched part or there are Scratch until clean do not get any other dirt attached. Prepare the softest sandpaper around the number 2000, because this number is usually the number that is in special for Body Motorcycle. but if there is a softer sandpaper is better to use the sandpaper. Wet also Motorcycle parts that you sandpaper with enough water. Begin sandpaper in the Scratch section, remember to be careful in its sandpaper because if not careful will cause new Scratch. sandpaper by 1 way to the left and right or up and down. Indeed this way requires patience to do so and also quite a long time if the number of Scratch a lot. If you have finished immediately clean it with water and then dry the sections on the sandpaper earlier. the technique is usually used in many people is using a liquid called Compound. The function of the compound itself is to remove other paint marks attached to our Motorcycle paint. Clean the part that we will compound, do not forget to dry with a dry cloth first. Take the compound by pinching it sufficiently with rubbing cloth by pressing and rotating on the Scratch in our Motorcycle. Brush continuously until the Scratch are gone. To compound itself many brands and please use anywhere and can be found in the shop/shop material/paint magic or some department store that provides automotive tool tools at a cheap price. The function of the compound is to lift the former paint attached, there is 2 genius compound that is the white compound to remove the smooth Scratch while the red compound to remove the rough Scratch on the Motorcycle. This method is almost the same as the number 2 is a compound, the use of Motorcycle polish is also believed to help reduce Scratch on Motorcycle. Although only reduce or eliminate small Scratch, some polish brands like kits or others are still a choice for automotive lovers to remove Scratch. Prepare a clean and smooth cloth to polish rub to our Motorcycle. Do not forget to clean the first part that we will polish, and dry the part because if it is still wet will reduce the performance of polish. Pour the polish into the clean cloth we have prepared, remember to pour into the fabric first. Because sometimes many are poured directly into the body of our Motorcycle. Rub by pressing and rotating on the Scratch in our Motorcycle. Do it patiently and continuously to produce a good effect. With the advancement of some of the world's technological impact also with advanced technology in the automotive field, as we know there are some tools that say magic tools to eliminate small Scratch up to big Scratch. We take the example of the brand Fix It pro, this tool provides ease and efficiency in eliminating Scratch on our Motorcycle with shapes similar to markers. Although the price is more expensive than 3 ways above, easy way to make us will choose this way. The trick is just scraping the part that resembles a marker to the surface beret, with the Scratch immediately closed and will not be visible to the invisible. This tool is now widely sold in some Indonesian marketplace. the last tip of this one might be the most recent way to choose when the Scratch is hard to remove in some ways above. Using Variation or full body Stickers is the last resort for you who do not want your motorcycle look Scratch.Tips can also be as long-term protective because by installing full body stickers will protect our Motorcycle from Scratch that will come when parking in public places. Thanks for reading: How to Remove of Scratch Motorcycle 100% Most Effective.